This information comes from a report entitled, OUT OF FOCUS: How Millions of People in West and Central Africa Are Being Left Out of the Global HIV Response. Second, the (U.S.) President’s Emergency Plan for AIDS Relief (PEPFAR), The Global Fund and UNAIDS all give priority to the same geographical areas or population groups with high transmission, but it is unclear what support is provided outside these hotspots. Third, the challenges created by the weak health systems, especially with respect to procurement and supply management, make it difficult for donors to manage investments and achieve impact. If a donor invests in treatment in countries in the WCA, and if the ARVs are not reaching the people who need them, this acts as a disincentive to further investment. Fourth, the WCA region relies too heavily on a single donor: The Global Fund. 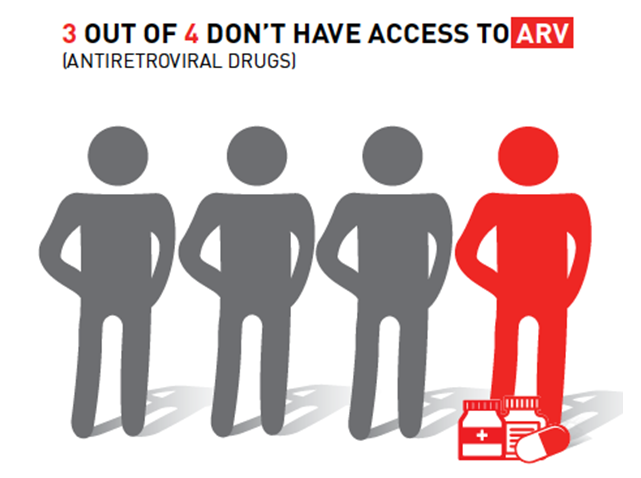 MSF said that with donors such as the World Bank and several bilateral funders withdrawing from HIV, and in particular from ARV funding, the Global Fund plays an increasingly important role in the ARV market, taking on about a third of ARV purchasing. Several countries in the WCA are classified by the Global Fund as “challenging operating environments.” To mitigate these challenges and improve results in these contexts, The Global Fund allows for more flexibility in in both the applications process and in grant implementation. According to MSF, in practice the application of such flexibilities has so far been limited. It cited the examples of recent Global Fund proposals submitted by the Democratic Republic of Congo (DRC) and Guinea. Both proposals experienced significant delays, due to new and more demanding application processes which, in turn, contributed to delayed implementation. With respect to the proposal from Guinea, GFO has learned that The Global Fund required Guinea to develop a national strategy for key populations before the grant was signed. In its report, MSF puts forward several recommendations for increasing ART coverage in the WCA region, including, for example: create political pressure to mobilize around the 90-90-90 targets; tackle stigma and discrimination, educate patients and promote human rights; and drastically increase access to pediatric ARV formulations. The report includes case studies on three WCA countries: Central African Republic, DRC and Guinea. Gemma Oberth contributed some reporting for this article.